Spanish is a Romance language, basically it means that its great great grandparent was Latin. Actually it was Vulgar Latin, the language adopted by the tribes who had invaded and destroyed the Roman Empire. Spanish comes from the Castile area in Spain and that why it's also called the Castilian language. In our "language race" Spanish is finishing the second with a score of 470 million people who call this language their mother tongue. The United Nations sixth official language, an official language in European Union and the Pacific Alliance these are some remarkable rewards obtained by Spanish. Chronologically Spain was the second nation after Portugal which dominated in the sea before the British ruined the Spanish naval empire. The most influence of Spanish was on the west coast of South America where it remains both the native and official language in the regional countries. One interesting historical fact says that when a British expedition lead by Francis Drake invaded the territory of the Spanish interests on the Pacific coast of South America the local Indians were very surprised as they had not even suspected there could be other Europeans apart from the Spanish. 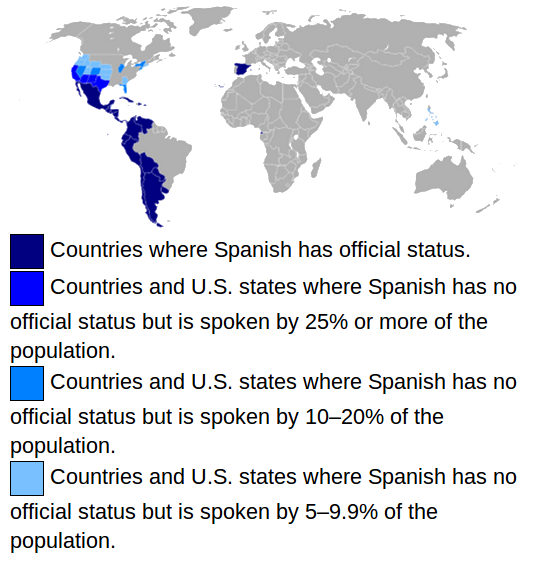 Many people ask if there's a difference between Spanish spoken in Spain and the language they speak in Latin America. Yes there is. You can roughly compare it to the difference between British and American English.